Just Got the Printer I need help installing it. How to load the labels? If you want to print temporary id badges, or temp ids for short, from your desktop then you will need to already have Identification Badge Software (ID Software). The ID Software houses your database and we suggest that you use the same template you use for hard card IDs to make the process quick and easy. Instead of sending the print job to the hard card printer, you send it to tempids.com's temp id printer. Some software provides a pop up box upon hitting the print command and you double click the temporary id printer at this point and the temporary ID badge prints. Other software are hard wired from the print command which means that no pop up box appears and the job is printed. In "hard wired" cases, you need to go into the ID software printer set up or tools area to switch the printer to the temporary ID printer. Our temp id label printers are compatible with your ID software. The temporary ID system is composed of the printer and software. In those cases where you are entering new people at the same place where the temporary id is given out, then a camera is needed. We suggest that you use your current system and augment it with our temp id printer to keep your set up costs low. Using the same template means that you are using the most up to date database. This is easier than having to save and upload the database every day. Chances are you already have ID software at your site. If not, then we have ID Software that is easy to use. This applies not just to the print function, but to importing databases from excel, easy record maintenance, and badge design. I need help installing it. How to load the labels? 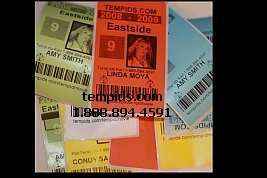 All things related to Temporary ID badges -- labels, printer, software, and tech support -- TempIDs.com. Using our labels for your temp ids lets you know if someone is trying to use yesterday's Temp ID badge again today.